Chef Michel Nischan, CEO, Founder and President of the non-profit organization, Wholesome Wave, shares "healthy, sustainable, and local" recipes as part of the fourth annual New York Culinary Experience hosted by New York magazine and The International Culinary Center. I had the opportunity to cook with as well as get to know Chef Michel Nischan during a cooking class on April 28, 2012, as part of a two-day culinary extravaganza called the New York Culinary Experience, and held at the prestigious culinary school, The International Culinary Center, located in the SoHo neighborhood of New York. 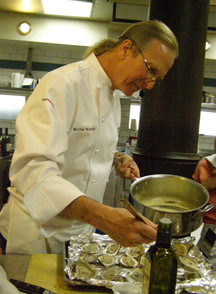 Chef Michel Nischan, with his lanky frame and blonde hair pulled back into a ponytail, looks like a musician, and when not in the kitchen cooking, he plays guitar and bass every other Friday night with his band, House Dressing, playing R&B, folk, and some of his original songs, at his restaurant, the Dressing Room in Westport, Connecticut. A musician before he became a chef, he started cooking at his mother's urging, taking a job as a breakfast cook at a truck stop at the age of 19. He has since parlayed that into an impressive culinary career, receiving many awards throughout the years, including receiving a prestigious James Beard Foundation Award, as well as writing cookbooks. When asked why he chose cooking over a career in music, he replied, "In a kitchen, at least you eat." A "sustainable food pioneer" he founded Wholesome Wave, whose "mission is to improve access and affordability of fresh, healthy, locally-grown produce to historically underserved communities. Doing so creates economic viability through local food commerce that can rebuild our nation's food system." "Their vision is to help lead the way in developing a more vibrant and equitable food system for everyone by fostering stronger relationships between local and regional agriculture and under-served individuals from both urban and rural communities." "Wholesome Wave is a national 501(c)3 organization dedicated to supporting small and midsize farms, and making fresh, healthy, locally grown fruits and vegetables available to all people, regardless of income. Wholesome Wave partners with farmers markets, community leaders, healthcare providers, like-minded nonprofits and government entities to implement programs that benefit both consumers in underserved communities and the farmers who provide for them. They operate by partnering with community-embedded organizations to implement our programs, including our Double Value Coupon Program, the Fruit and Vegetable Prescription ProgramTM and Healthy Food Commerce Initiative. Wholesome Wave programming is now in 26 states and the District of Columbia with more than 50 partners implementing the DVCP and FVRxTM in more than 250 participating farmers markets." Chef Michel Nischan graciously shares his recipes for Butter Roasted Oysters, Grilled Eggplant Parmesan "Custard," and Meatloaf using local, sustainable, and healthy ingredients. Michel Nishan's Butter Roasted Oysters topped in a beurre blanc sauce were beyond wonderful, they were what he called "succulente," (pronounced succulent-tay), a word he made up using a combination of English and Spanish. Why? "Because sometimes, one language is not enough to describe something that you really think is wonderful." Although I occasionally eat oysters, they are not normally something that I rush to order. With that said, I definitely changed my opinion of them when I tasted Michel's version, which were fresh, flavorful, and delectable under their light beurre blanc sauce. They were, to quote Chef Michel Nischan, succulente! Method: Position the broiler as close as possible to the source of the heat. Preheat the broiler. 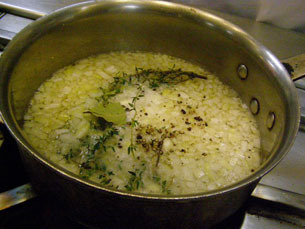 Heat the wine, vinegar, sliced shallot, peppercorns, and by leaf in a small saucepan over medium-high heat to a full simmer. Reduce the heat. Cook for 8 to 10 minutes, or until most of the liquid has evaporated and what is left is the consistency of maple syrup. With the heat on low, whisk in the butter, a few pieces at a time, until all is incorporated. Do not add another piece of butter until the previous one is incorporated. Do not raise the heat. The sauce could break if it gets too hot. Strain the sauce through a fine-mesh sieve. Season to taste with salt and pepper. Set aside, covered, to keep warm. Spread the rock salt in a single layer in a shallow baking pan that can fit under the broiler, such as a jellyroll pan. 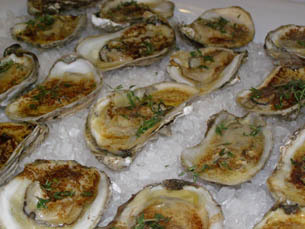 The salt will help the oysters stay level when you broil them. 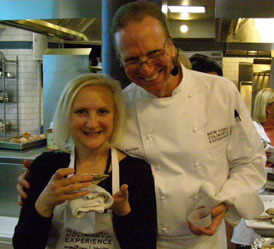 Arrange the oysters, still in their bottom shells, on the salt, making sure they remain as level as possible. Set a shallot slice over the top of each oyster. Spoon the butter sauce over each oyster. Broil the oysters for about 5 minutes or until the sauce browns and breaks slightly. 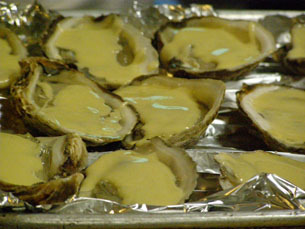 Remove the oysters from the broiler. Sprinkle with thyme. Season with salt and pepper. Serve warm. Grilled Eggplant Parmesan "Custard" is a play on word eggplant as custard uses eggs, and the creamy texture of the cooked eggplant that has the mouth-feel of custard. 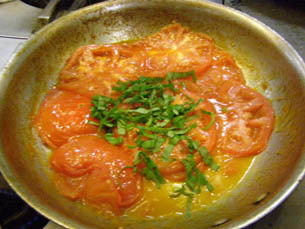 Method: Put the tomato slices in a saucepan and drizzle with the olive oil. Set over medium heat and cook, stirring gently to only prevent sticking, for 2 to 3 minutes, or until the tomatoes begin to soften. Add the bay leaves or basil leaves, remove the pan from the heat, and set aside for 30 minutes. If you used bay leaves, remove them and transfer the tomatoes to a blender or food processor. Puree until smooth; you should have about 2 cups. Season to taste with salt and pepper and set aside. Prepare a charcoal or gas grill for grilling over a medium-hot fire. Lightly oil the grill grate. Coat the eggplant halves with the grapeseed oil and season well with salt and pepper. Place the eggplants, skin side down, over the hottest part of the fire and grill for 15 to 20 minutes, or until the skin blackens, the juice boils up through the flesh, and the flesh is tender but not mushy. The timing will depend on the thickness of the eggplant. Use the tongs to mover the eggplants during grilling so that they cook evenly. Make an indentation about 1 inch deep in the flesh of each eggplant half and spoon a generous amount of pureed tomatoes into each indentation. Don't hold back! Grill for about 5 minutes longer, or until the sauce is hot. For a slightly smoky flavor, cover the grill. Sprinkle evenly with the parmesan cheese and grill for a few minutes, or just until the cheese begins to melt. If you have more sauce, use a fork to push down the soft flesh of the eggplant and spoon more sauce in the indentation. Serve immediately. 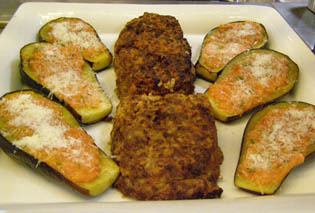 This recipe for meatloaf incorporates cooked diced parsnips, carrots, celery root, and milk, mixed in the ground beef. Method: Preheat the oven to 375° F (191° C). In a large sauté pan, heat the oil over medium-high heat. When hot, sauté the parsnips, carrots, celery root, and onions with a pinch of salt and pepper for 6 to 8 minutes or until softened. Set aside for 10 to 15 minutes to cool slightly. In a large mixing bowl, mix together the bread crumbs, milk, eggs, ketchup, salt and pepper. 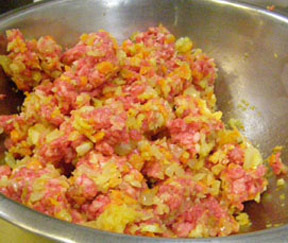 Add the meat and cooked vegetables and using a wooden spoon or your hands, mix well. Transfer the meat to a loaf baking dish. Bake for about 1 hour and 30 minutes or until the meatloaf is heated all the way through. An instant-read thermometer inserted in the center of the meatloaf will read 145° F (63°). Serve the meatloaf from the pan. Slice into serving pieces 1-inch thick. 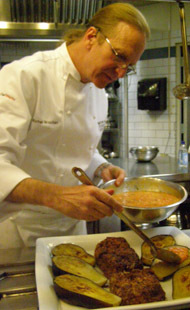 Read about Chef Michel Nischan's class in the Gastronomy section. Read additional articles on the New York Culinary Experience in the Gastronomy and Chefs' Recipes sections. To attend the New York Culinary Experience 2013, please visit the New York magazine website: www.NYmag.com/nyce .